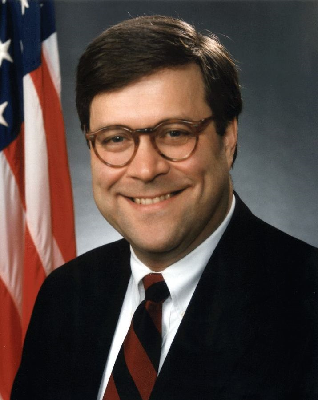 William Barr has been nominated as Attorney General and will face confirmation hearings in January. He’s a respected Republican lawyer who served as AG under GW Bush and worked in the Reagan Administration. He’ll oversee the Mueller Investigation. 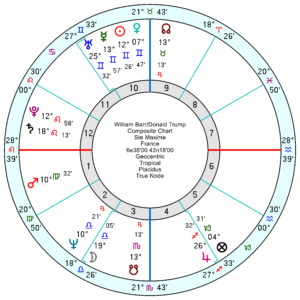 Born 23 May 1950, 11 days after Chief of Staff (for now) John Kelly, he’s a Sun Gemini with Saturn and Mars in diligent Virgo; a determined and practical Mercury in Taurus square Pluto, trine Saturn and Mars – capable of expressing himself forcefully. 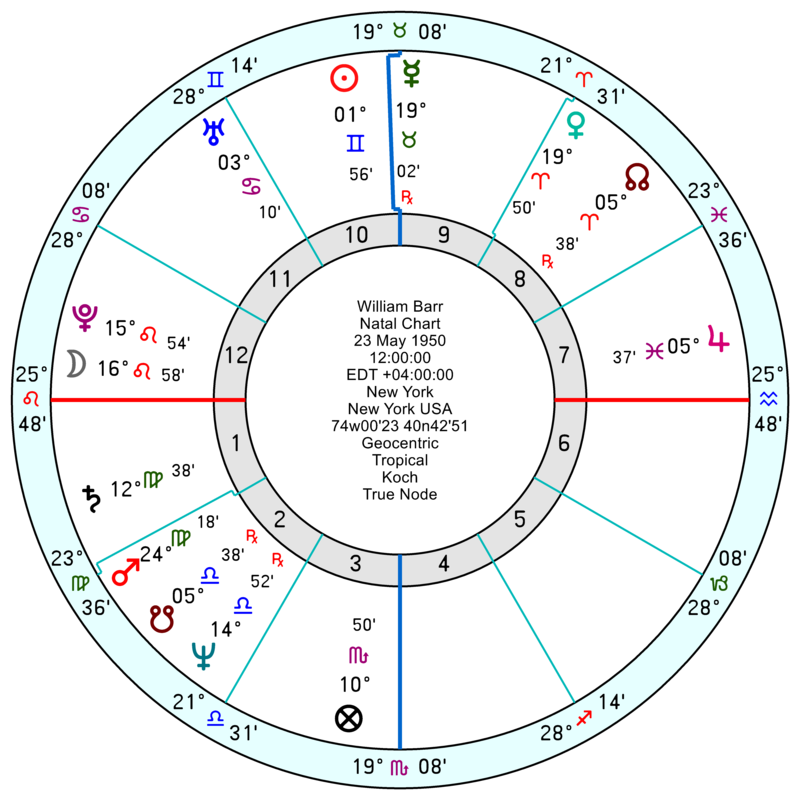 For someone who’s been offered a top job, he’s not looking overly happy with an edgy, insecure tr Uranus square his Sun/Mars midpoint now till early February; and a sagging tr Neptune square his Mars/Jupiter in January eroding his self-confidence. A discouraging February into March; and into rolling catastrophes from May onwards. 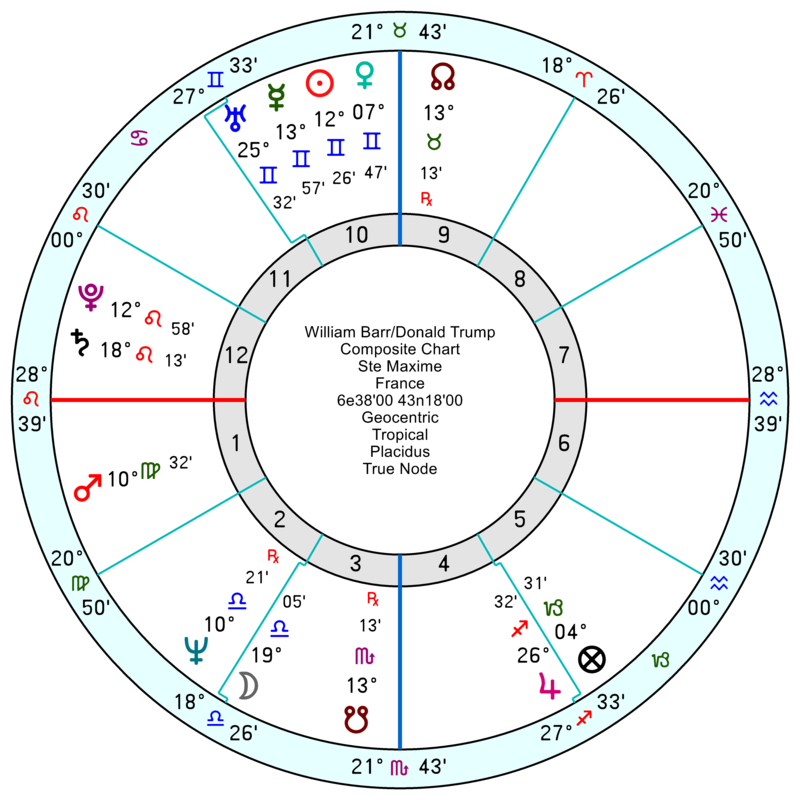 His relationship chart with Trump isn’t quite as tricky as Trump with John Kelly, but there’s still an irritable, argumentative composite Sun square Mars. 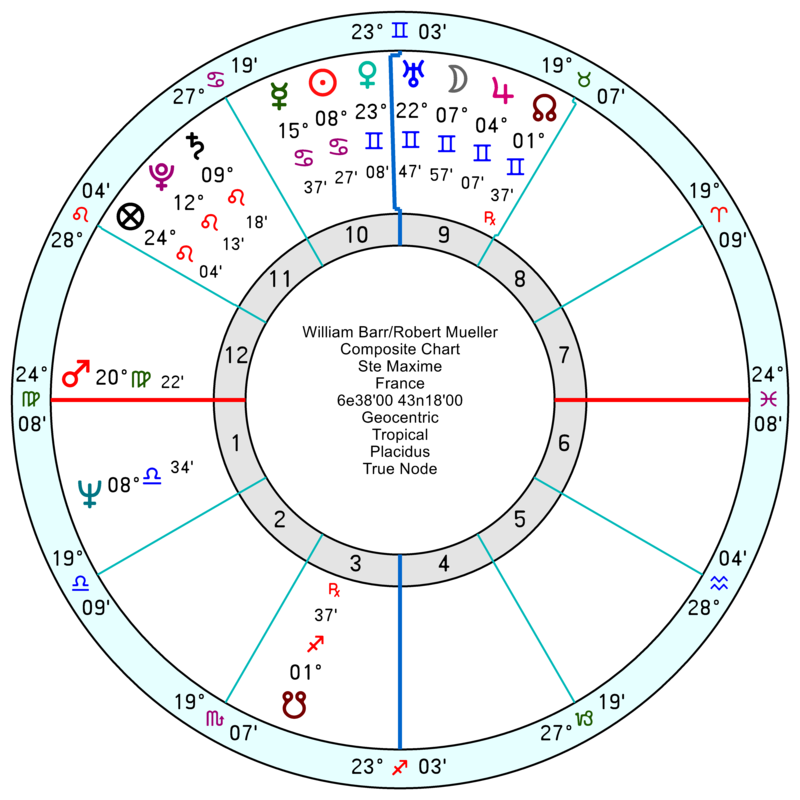 Which is hardly surprising since Barr’s Mars in Virgo squares Trump’s Sun Uranus and Moon. Won’t all be sweetness and light. 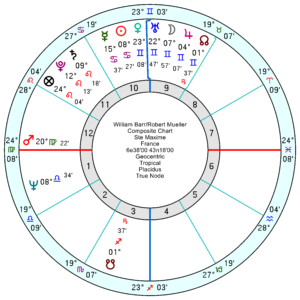 His relationship with Robert Mueller is volatile with a composite Mars square Uranus, which is likely to flare up at times; and not always trusting with a composite Sun square Neptune. Barr has a sketchy American history as having worked with the biggest crooks in DC during the 90s. 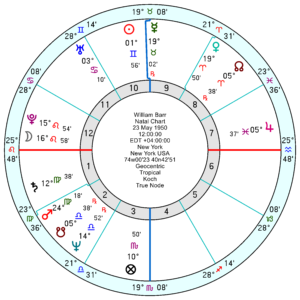 In a solar chart he has Pluto transiting his 2nd house. He owes….so off to work he goes. Whitaker, a Scorpio, was better suited for the job during this time in our history. Let’s see if Barr has the gonads to act on patriotism rather then easy investments with big returns. Gemini people aren’t exactly the kind I would choose for my team. Given Trump’s huge legal problems, it is not too surprising that Barr’s aspects are not so upbeat going into this appointment. Already he has stated that he’s taking this not because he has ambitions to be AG again, but rather out of duty. He realizes that he’s getting himself into a long slog. Barr’s nomination is a distraction, to an extend, as is the latest Kelly story. Manafort and Cohen Sentence Memos have to be submitted today, Friday 7th. It’s unclear what will come out after retracted parts. I suspect neither is as heavily retracted as Flynn’s. They are both what I’d call fixers with knowledge on crimes that do not necessarily have any Nat Sec meaning. And Manafort isn’t collaborating. I’m not saying Barr won’t make it. He actually has truly remarkable credentials on his field for any Trump Admin member. I’d say that out of the current Senior Members, only Defence Secretary Mattis is more qualified, and as much as this hurts to me, National Security Advisor Bolton as qualified as Barr. He did work on Bush 41 pardons in Iran-Contra Scandal, and if Republicans see writing on the wall, they will see this as an asset, too. I think he should easily pass in Senate. But I suspect he won’t be there to pardon most people indicted, given trials coming from any ulterior indictments from Mueller won’t start until late 2019 or early 2020, on this date (and, in fact, I think Mueller could be “dragging” the investigation just to ensure big bangs will come when The US is in a full campaign mode).